Welcome back for the seventh day of Mayfairstivus, the nine day celebration of Mayfair Games’ DC Heroes Role-Playing Game! 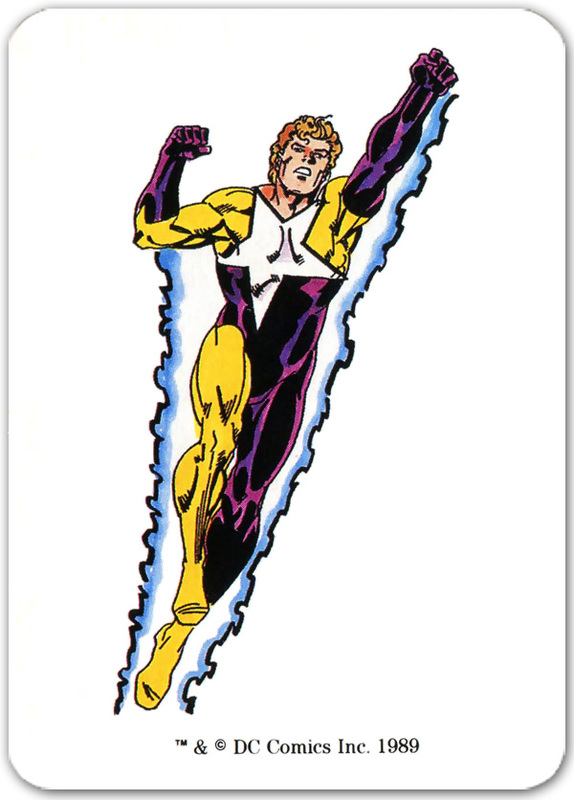 Today we’ll be looking at the 1989 character card for Starman (Will Payton)! The Will Payton Starman series holds a special place in my heart. While the Jack Knight Starman was the best-written, Will Payton’s adventures were the most fun. Will Payton was an upbeat, straightforward superhero that came along during a time when most superheroes were dark and gritty. Personally I was reading lots of these darker superhero comics, along with nearly all of DC’s mature readers proto-Vertigo books (i.e. Sandman, Doom Patrol, Swamp Thing, Hellblazer, Animal Man, Shade the Changing Man, etc). Reading these types of titles was seriously starting to affect me. I found all the “extreme” superheroes and mind-trippin’ proto-Vertigo books were weighing heavily on my shoulders. While I was interested in the books I was reading, I wasn’t necessarily having fun anymore. When I stumbled across Starman #26 in 1990 it was like a breath of fresh air! Here was a superhero that was big on action and fun! This book rejuvenated my love for superhero comics! I immediately picked up all the back issues and stayed with the series until the end. Whenever I feel bogged down by too much drama in my monthly comics, I remind myself to seek out fun books like Starman. As I mentioned, my first issue of Starman was #26. This was the debut of Starman’s new costume. 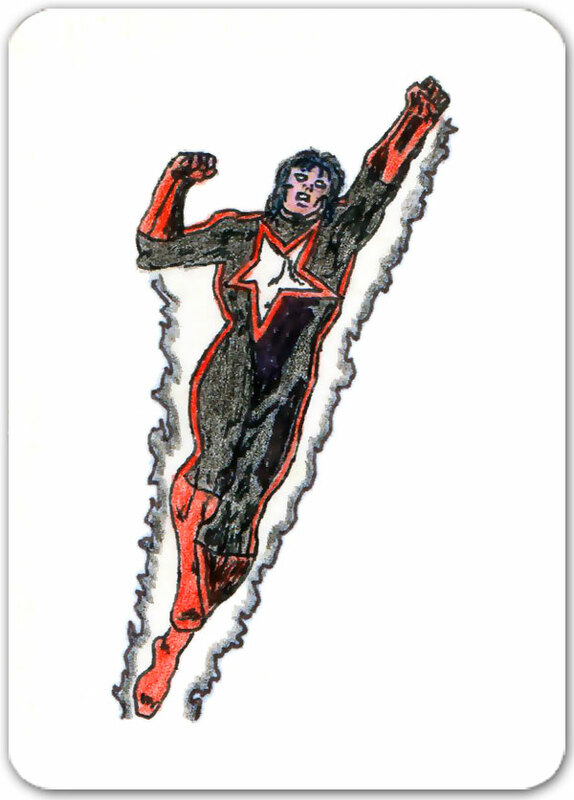 Maybe it’s because I started reading Starman when he was wearing a different costume, but for whatever reason I’ve never cared for the costume shown above. The colors always make me think of a peanut butter and jelly sandwich. In fact, I preferred the newer costume so much, at some point I re-drew the card front and used my own sketch below in place of the card above. 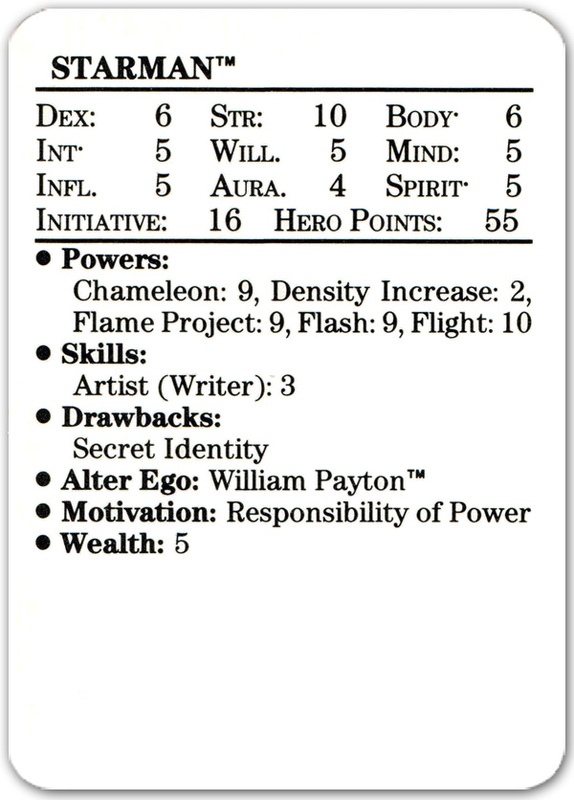 Clearly my own personal Mayfair DC Heroes stats would not include the Skill “Artist”. Don’t forget, the Mayfairstivus celebration continues at the following blogs! Be sure to check them out throughout the Mayfairstivus celebration (Dec. 1-9). Come back tomorrow when we look at some of my favorite modules and sourcebooks from the Mayfair DC Heroes RPG! Will has always been my favorite of the Starmen. Stern and Lyle grabbed that book by the staples and gave us one fun superhero romp. It was loaded with guest stars, great supporting characters, and awesome adventure, but most importantly it was a fun read month in and month out. There were issues that the characters had to confront, but they did so in a manner that made them seem more alive. The fact that Robinson picked up on those characters adds further testament to the work by Stern and Lyle. I had the pleasure of meeting Lyle after he had long moved on from Starman, and he was very kind about his time on that book. I just might have to re-read me some Starman tonight. The black and red costume is my preferred costume between the two, but the fact that Jayne made the purple and yellow one for Will just made that one sentimental for me, being a fan of all the characters of the series. @Doug – Good description of the series! That’s nice to hear that Lyle was still warm towards the book down the line. I absolutely love the Robinson Starman series and appreciated the recognition given to Will Payton and Jayne, but I wish they’d not connected him to Prince Gavyn in that way. Not a major gripe, just a minor quibble. Oh, wait… that’s issue #28. I haven’t had time to look over the entire Mayfairstivus . . . did anyone talk about the awesome solo adventures Mayfair put out? I loved those as a kid. I only ever read Eclipso-related Will Payton appearances, so I never really warmed to the character, but I certainly relate to the sentiments that drew you to him. I’d say Empowered is my closest such escapist favorite now. That first costume may have debuted in 1989, but its heart was firmly set earlier. The design sense was somewhat ’70s, but jazzercized with that oh-so-80s color scheme. It made Booster Gold and his popped collar look hip. It’s so gaudy, they overreacted with the “kewl” red and black to compensate. I think I like the yellow and purple better specifically because it’s so deliciously awful. Steven, I hope to take a look at the Atom in Hot Pursuit before Mayfairstivus wraps. I remember Will Payton fondly. That was one of the first titles I got in on the ground floor with and I loved the character, the relationship with his mother and sister and his reluctance to become a super hero at all and his sister pushing him into the role. What I didn’t like was the black and red suit and that they ended the title by killing him off (or so it seemed at the time).